There is therefore now no condemnation for those who are in Christ Jesus.2 For the law of the Spirit of life has set you free in Christ Jesus from the law of sin and death. 3 For God has done what the law, weakened by the flesh,could not do. By sending his own Son in the likeness of sinful flesh and for sin, he condemned sin in the flesh, 4 in order that the righteous requirement of the law might be fulfilled in us, who walk not according to the flesh but according to the Spirit. 5 For those who live according to the flesh set their minds on the things of the flesh, but those who live according to the Spirit set their minds on the things of the Spirit. 6 For to set the mind on the flesh is death, but to set the mind on the Spirit is life and peace. 7 For the mind that is set on the flesh is hostile to God, for it does not submit to God’s law; indeed, it cannot. 8 Those who are in the flesh cannot please God. There is a life of peace, but it is not worried about self. When I am building my own kingdom, managing my own image, or nervous about how I am perceived I lose my peace. A kind of death breaks out and starts to creep through my system and sap my energy. One of the places I can see this principle at work most completely is when I receive criticism. When I am in the flesh I suddenly feel like all hope is lost when I am criticized. I think that something is wrong with me and I am not safe. I want to defend myself and let the person who criticized me know that I am not the way that they think I am. When I am in the flesh I can not embrace opportunities without the voice of my detractors from years gone by who remind me not to get ‘too big for my boots’, or to think I am something special. The truth of the passage is that I am not condemned. I can forget myself and focus on Jesus. Jesus’ Spirit will walk with me and align me with God’s will. It is not humility to be self-loathing or self-obsessed. The blessed freedom comes when we are lost in the Spirit and the self is silent. Those who worry about their image, or become paralyzed by their own limitations can not please God. However, life is not about our image or limitations. Those limitations are God’s opportunities. A chronic lack of confidence and a sense of fear of others is a sign that I am not walking in your Spirit. Let my eyes be focused more by faith on the Spirit as we walk into the challenges of the day. May we find peace and security in forgetting ourselves. May we experience the freedom of no condemnation. 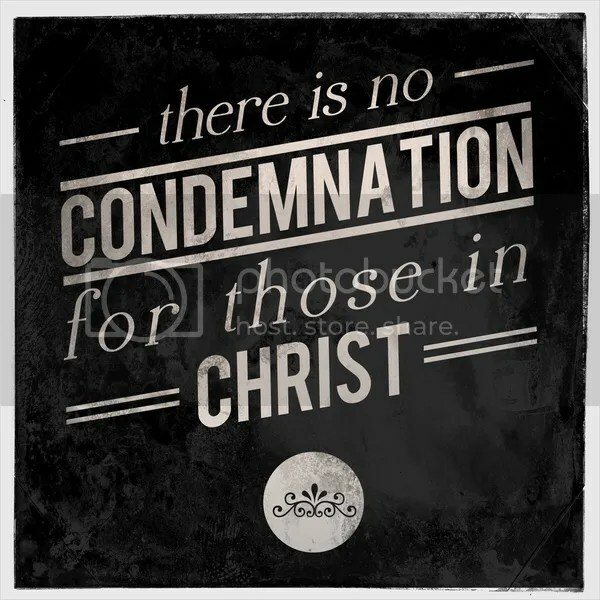 Why is there now no condemnation? How is a life free from condemnation related to the Holy Spirit? How is walking in the Spirit described? What condemnation, self-loathing, fear and doubt hangs over you? How can you look more to the Spirit today and live the full life that God has prescribed? Peter, Thank you for your dedication to your writing and total surrender to God’s calling and discipline for your life. The transparency, vulnerability, and passion in which you write this blog is a blessing to me; you write what I am thinking. May God bless your ministry richly. I look forward to another year of timely and succinct posts. Thank you Jonathan. Your simple faith and positive attitude have been an inspiration to me. Hope we will see each other more frequently in 2016.